1 whole turkey, 12-14 lbs. TIP: Experiment with different herbs and spices in your Maple Glaze. Substitute rosemary with other fresh herbs like parsley, thyme and oregano or add some spices like Cajun or Cayenne. Make sure the turkey is thawed and the giblets and neck have been removed. Pat the turkey dry with paper towels. 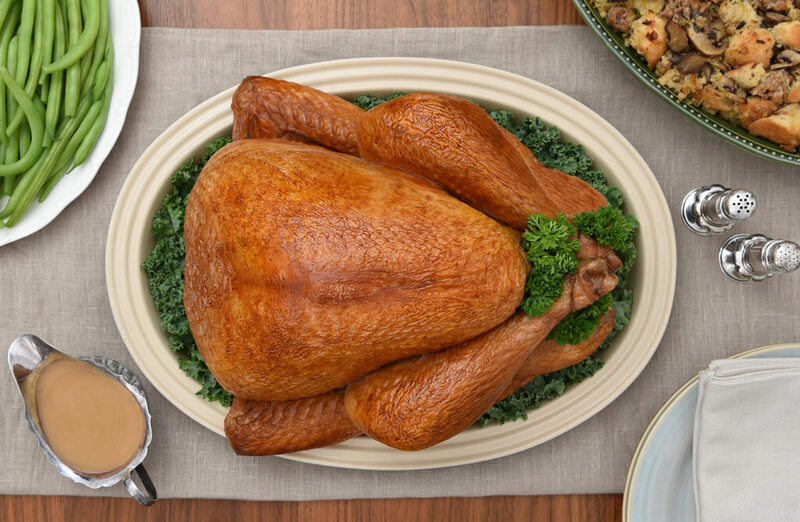 Rub the turkey with olive oil, inside and out. Stuff cavity with chopped celery, carrots and onions. Combine all spices to make a rub. Sprinkle generously onto the bird, inside and out. Place the turkey in your roasting pan. Add the wine and the broth. 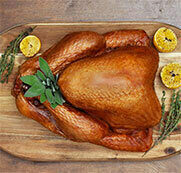 Roast the turkey for 3 3/4 – 4 ½ hours, until the juices run clear and an instant thermometer reads 170°F in the thigh. Baste the turkey generously in the last hour of cooking, every 20 minutes. Re-apply in the last five minutes of cooking. Once cooked, remove the turkey from the oven and let it rest for at least 20 minutes before carving. Combine all ingredients in a small saucepan. Bring to a boil and then lower to a simmer for 30 – 45 minutes until syrup has reduced to about half and the glaze is thick and syrupy. Remove fresh rosemary stems and discard. © 2019 Canadian Turkey Marketing Agency c.o.b. Turkey Farmers of Canada. All Rights Reserved.